Blockbuster: Mavs land Kristaps Porzingis, deal Dennis Smith Jr. The Mavs and New York Knicks have reportedly agreed to swap young standouts in a blockbuster deal. If they weren’t already, the Dallas Mavericks are about to be the most popular NBA team in Europe. 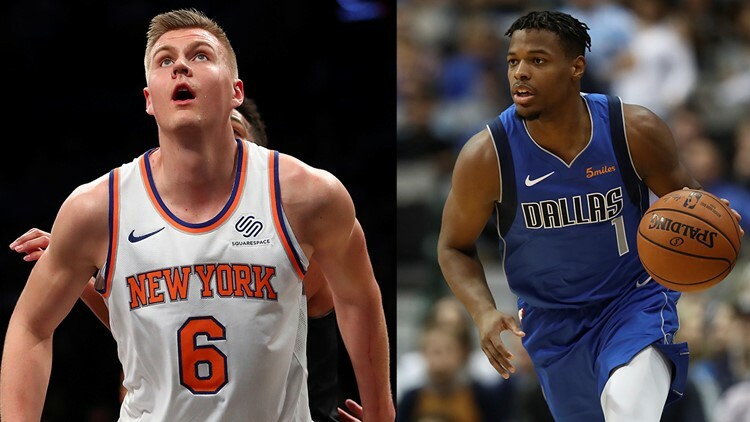 The Mavs will send Dennis Smith Jr., Wesley Matthews, DeAndre Jordan and two future first-round draft picks to the New York Knicks for 23-year-old Latvian star Kristaps Porzingis, along with guards Tim Hardaway Jr. and Trey Burke and forward Courtney Lee. ESPN basketball savant Adrian Wojnarowski first reported the deal. Matthews and Jordan are each set to become unrestricted free agents after the 2018-19 season. Porzingis, a 7-foot-3 power forward, hasn’t suited up this season after tearing his ACL last February. He’s averaged nearly 18 points and seven rebounds per game in his three seasons with New York since the Knicks picked him 4th overall in the 2015 NBA Draft, and earned an All-Star nod last year. If healthy, he figures to be a potential cornerstone for the Mavericks franchise alongside 19-year-old budding superstar Luka Doncic. Hardaway, who is under contract for two more seasons at about $18 million per year, is averaging 19 points per game for the Knicks this season. His father, Tim Hardaway Sr., played 54 games for the Mavericks in 2001-02. The 33-year-old journeyman Lee has only played in two games this season. Smith has been at the center of drama this season in Dallas, which came to a head when he spent some time away from the team during a road trip earlier this month. The team had previously denied rumors their 2018 No. 9 pick was on the trade block, saying the team preferred to work things out with the second-year player. Smith's final game as a Maverick was a triple-double (13 points, 10 rebounds, 15 assists) against his new team, the Knicks. The blockbuster deal will open up a mountain of cap space for the Knicks. The NBA trade deadline is Feb. 7.